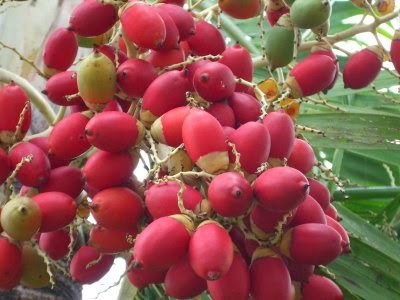 Pinang or nut plants generally planted in the yard, in the gardens or cultivated, sometimes growing wild on the banks of the river and other places, can be found from 1-1400 m.
Slim-trunked tree, grows erect, 10-30 m, diameter 15-20 cm, unbranched with loose leaf scars. Pinnate compound leaves grow gathered at the end of the rod to form a rosette stem. Leaf sheaths tubular, length 80 cm, petiole short. Leaf blade length from 1 to 1.8 m, the child leaves in length 85 cm, width 5 cm, with the torn ends and scalloped. Cob flower with a long sheath that easily fall out, come out from under the rosette of leaves, length of about 75 cm, with a short stalk branched double. There is 1 female flowers at the base, on top of many male flowers are arranged in two rows are stuck in the groove. and male flowers is about 4 mm long, and color yellow white stamens 6. The female flowers is about 1.5 cm long, green color and will bear fruit one. Breech elongated ovoid, 3.5 to 7 cm long, stringy fruit walls and reddish orange color when ripe. Seed one, shaped like a short cone with rounded ends, the base is rather flat with a shallow indentation, 15-30 mm long, outer surface brownish to reddish brown, slightly grooved resembles mesh with lighter colors. Top and innermost fronds lalab or eaten as pickles, being the fruit is one of the herbs to eat betel, and a plant producing tanning substances. Leaf sheaths are Sundanese called upih, used for wrapping food. Propagation by seed. Part used: seeds, leaves, husks. Seeds (Binglang) To Treat: worms taeniasis, fasciolopsiasis, Abdominal bloating due to indigestion, swelling due to fluid retention (edema), Sense of fullness in the chest, ulcers, cough with phlegm, diarrhea, Late menstruation, vaginal discharge, beriberi, edema, Malaria , Minimize the pupils (miosis) in glaucoma. Leaves To Overcome: No appetite, waist pain (lumbago). Coir To Overcome: Indigestion (dyspepsia), constipation, edema and beriberi. Usage: To drink: 5-10 g of dried beans or 5-10 g fiber, boiled. Use Outside: Seed to taste boiled water to wash wounds and other skin infections. Wormy: 30 g of betel pinang powder with 2 cups boiling water, simmer in 1 hour. After chilling filtered, drinking well before breakfast. Wounded: finely ground seeds, for use on wounds. Scabies: finely ground pinang seeds, then add a little water whiting until a dough like mush. Used to polish the affected body part scabies. Ulceration: Pinang, gambier, whiting respectively lizard eggs, tobacco and one fresh of betel leaves. All of these materials are mixed then finely ground. Apply on the scabs that have been cleaned. Dysentery: Pinang Fruit pale yellow color washed and soaked in 1 cup water for a few hours. Drinking the water immersion. Cleans and strengthens your teeth and gums: Thinly sliced of pinang seeds. Chew it every day for a few minutes, and then the waste is disposed. Lumbago: washed sufficiently pinang leaf, and then finely grounded. Add coconut oil, reheat briefly on fire. When warm is used to compress the waist sick. Diphtheria: 1 item finely ground dried areca pinang, pour 3/4 cup of hot water and 1 tablespoon honey. After a cold used to rinse your mouth in the throat for 2-3 minutes, then discarded. Do it 3 times a day. alkaloid compounds contained in the fruit is quite dangerous for the system requirements. Common are nausea and vomiting (20-30%), abdominal pain, dizziness and nervousness. To reduce the incidence of vomiting, drink a decoction of the drug after it has cooled. Side effects are rare gastric lesions accompanied by vomiting of blood. Signs of overdose: Many salivation (qalivation), vomiting, drowsiness and seizures. Wash the hull with a solution of potassium permanganate and atropine injection. To reduce the effects of the poison, the use of betel nut should that have been dried, or better yet when dried betel nut boiled before drinking. The habit of chewing betel nut, can increase the incidence of cancer-cheek mucosa (buccal cancer). Seeds: bitter, spicy, warm. Worming (anthelmintic), laxative fart (antiflatulent), menstruation laxative, laxative urine (diuretic), sputum, improves digestion, (astringent), laxatives. Coir: Warm, bitter. Energy circulation, laxative urine, laxative. Seeds: containing 0.3 to 0.6% alkaloids, such as arecoline (C8 H13 NO2), arekolidine, guvasine arekain, guvakolin and isoguvasine. Pinang also contains tannins 15% red, 14% fat (palmitic, starch caprylic, oleic, lauric, stearic, caproic, Myristic acid) and resin. Fresh seeds contain about 50% more alkaloids. Compared to seeds that have been processed. Arekolin: worming and efficacious as a sedative.